On October 3, 2009 thousands of horse lovers across the nation will pull on their boots or lace up their sneakers to ride or walk to raise funds for the horse related charity of their choice. Similar to a walkathon, the National Rescue Ride will bring together thousands of people across the country to demonstrate that abuse, neglect and shipping of horses across the border for slaughter are unacceptable. 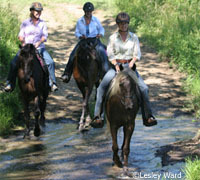 Participants may opt to ride a horse or walk on foot in their local ride. Like other walkathons, participants find sponsors to donate money for their local equine rescue charity. 100% of the sponsorship dollars go directly to helping horse rescue efforts. Registration is $20 for riders and walkers age 12 and older. The fee for participants under age 12 is $10. The top money earners are eligible for cash prizes, and all participants will receive a National Rescue Ride window decal or a certificate of participation. Horse lovers of all kinds as well as animal related charities, rescues and adoption agencies along with riding and pony clubs are all invited to join the National Rescue Ride. Those wishing to participate can go to www.nationalrescueride.org and register. Cool – thanks for letting us know!